The noted acting teacher, Sanford Meisner, once designed an acting exercise called "coming home to be alone." Its purpose for actors is to imagine that something very important or meaningful, for good or ill, has just happened to you, and that you are coming home to be alone with your thoughts. It is an important exorcise, allowing the actor to convey emotion without words, using only body language and most importantly - the face. There is a lot of coming home to be alone in Stéphane Brizé's Mademoiselle Chambon, an elegant and heartfelt love story that is not a love story. It is the tale of Jean (Vincent Lindon), a married man who falls in love with his young son's substitute teacher, Véronique Chambon (the luminous Sandrine Kiberlain, Lindon's real life ex-wife). He is a simple man, a construction worker, but when he is asked over to her house to replace a window and discovers that she is a violinist, he asks her to play something for him, having only seen violins before on TV. She shyly obliges, insisting that her talents are not that great. But her music communicates something to Jean, and he finds himself falling in love with her. When she plays the violin, it is as if she is speaking directly to him, saying everything she has neither the courage nor the willpower to articulate, and he understands every word. His home life isn't particularly unhappy, his relationship with his wife is stable and content. But he and Mme. Chambon share a strange, unexplainable connection that he cannot ignore, something neither can express but both feel just as strongly. Theirs is a relationship communicated through music. Chambon, shy and quiet; Jean, stoic and awkward - neither can articulate their feelings. They can only share them through their common love of the violin. It is a tentative romance, told through furtive glances and musical interludes, letting that which goes unspoken do all the talking as they awkwardly try to fill the silences with small talk. Soon Jean is faced with an impossible choice - abandon a happy home life for uncertainty, or pursue his undeniable love for Mme. Chambon, whose restless nature never allows her to stay in one place for very long. Much is communicated through Kiberlain's melancholy eyes alone. Her face reveals a deep loneliness that is both haunting and heartbreaking. What she is able to communicate while barely uttering a work is astounding. 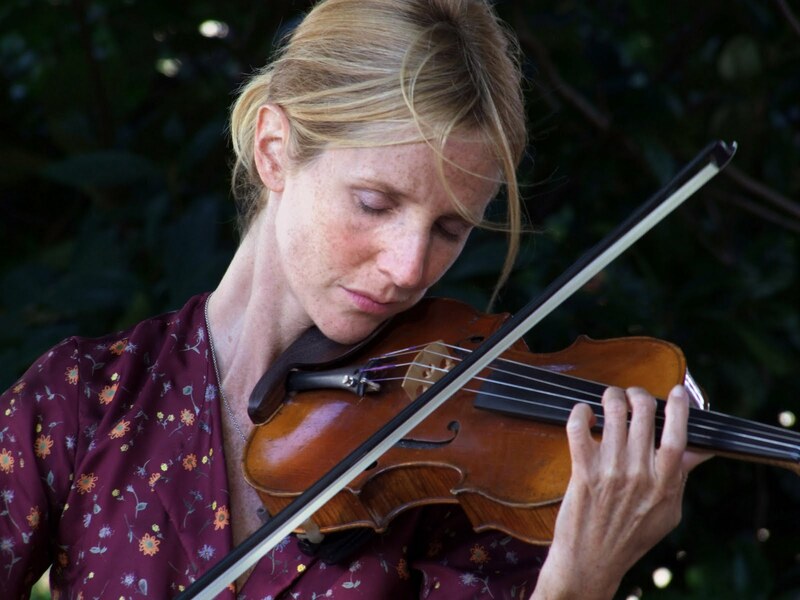 It's a remarkable performance in a completely lovely film, and if its themes of marital infidelity seem a bit old hat, Brizé imbues it with new life through his exquisite use of music to tell its story. Brizé uses music to describe the characters' feelings when they cannot - much of Mademoiselle Chambon's most striking moments come not through great writing (although the script is excellent), but through the physical performances of the actors and the music that reveals their innermost selves. In fact, Brizé's direction is so confident and the performances so assured, it could almost have been a silent film. As Norma Desmond once said in Sunset Boulevard - "We didn't need dialogue, we had faces!" Watching Mademoiselle Chambon, that quote carries a lot of resonance. For such a minimalistic film, it is incredibly visual, basing much of its emotion on wordless evocations. It is an aching and elegant narrative, a powerful and moving romance that says much while hardly saying anything. And in this day and age, that is an impressive achievement indeed. 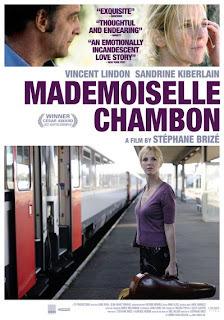 MADEMOISELLE CHAMBON | Directed by Stéphane Brizé | Stars Vincent Lindon, Sandrine Kiberlain, Aure Atika, Jean-Marc Thibault, Arthur Le Houérou | Not Rated | In French w/English subtitles | Now available on Blu-ray and DVD from Kino Lorber, featuring an interview with the director, deleted scenes, and more. Your final paragraph brings together all the elements that had me praising this film to high heaven upon its NYC release a few months ago. While my five-star rating may well have been a bit overboard (I am an avowed proponent of hyperbole, I'm afraid) I still consider it one of the ten best films of the year.